Treating a cold or fever with soup is an ancient and time-honored tradition. If nothing else, a bowl of soup, lovingly prepared, can make us think we feel better—even if it doesn't help cure our illness. 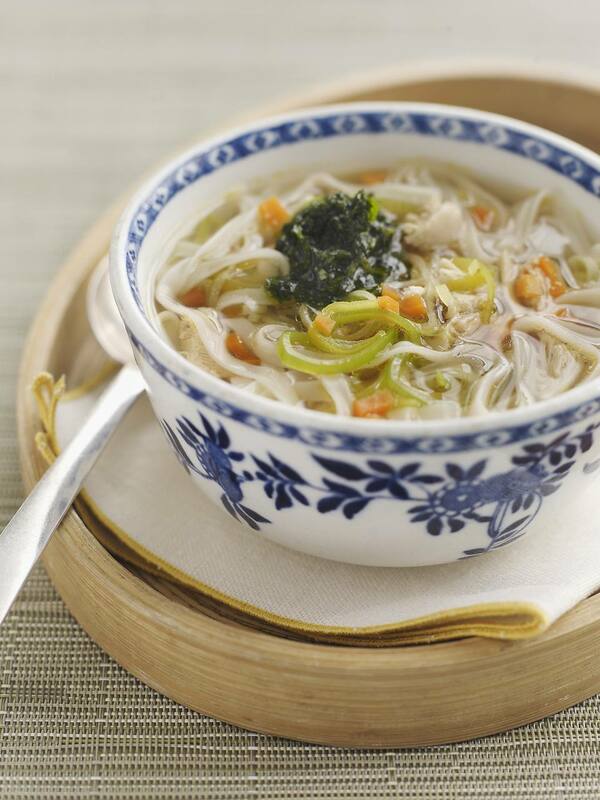 However, in addition to its ability to comfort, the Chinese believe certain soups have healing powers. A large part of Chinese medicine is based on the concept of yin and yang, the two forces that rule the universe. Depending on the context, yin refers to the feminine, darker, cooling forces, while yang represents the masculine, lighter, hot forces. Although sometimes depicted as being in opposition, in reality, they are meant to complement one another. So what does a philosophical belief have to do with medicinal soups? The Chinese believe illness is a signal that the two forces are out of balance. For example, if you have a cold, it is because there is too much yin in your body. A Chinese herbalist might prescribe a soup designed to restore the yang forces. Similarly, a fever might be treated with a yin soup. Over time, medical experts and herbalists have developed a classification system, in which foods are categorized as having either yin or yang properties. (we should point out that no food is purely yin or yang - it's more that one characteristic tends to dominate, which is why you'll sometimes find experts disagreeing over what category a specific food falls into). Physicians make use of these classifications when deciding on a course of treatment. Here are several samples of Chinese soups used to treat illness. Note that some of the soups are made with yin and yang ingredients, and thus are neither warming or cooling, but neutral. While western scientists have only recently begun to admit that chicken soup has curative properties, the Chinese have been treating illnesses with chicken soup for centuries. A warming or yang food, chicken, may be combined with many other ingredients, from spinach (a cooling food, thought to promote digestion and reduce constipation) to cordyceps, a rare plant grown in Tibet that is believed to increase stamina. And then there are gingko nuts, believed to improve memory. Less well known is that, in traditional Chinese medicine, gingko is believed to have a healing effect on the lungs. In The Chinese Kitchen, Eileen Yin-Fei Lo notes that in the past chicken soup with gingko nuts was prescribed as a cure for coughs. You may have been served Chrysanthemum tea at a Chinese restaurant. A cooling food, Chrysanthemum is also used in soup, as it is said to be good for ridding the body of fevers. According to the National Chrysanthemum Society (USA), the boiled roots of the chrysanthemum have also been used as a headache cure. (Note: only certain varieties of chrysanthemum are used for medicinal purposes). Smaller than western figs, Chinese dried figs are reputed to moisten the lungs, and thus help cure coughs. In Wisdom of the Chinese Kitchen, Grace Young says that this harmonizing soup finally helped her cure a cough that had been hanging on for months. The almonds in the recipe are two types of Chinese almonds—nom hung, and buk hung. They are available in Asian markets. In China, sweet fruit soups are sometimes served for dessert. Certain fruits, such as bananas and strawberries, are cooling and help to prevent infections. Many of the Asian fruits, such as litchis and guava, are warming. Ubiquitous in Chinese cooking, you'll sometimes find it in soups as well, particularly seafood soups. A yang food, ginger is thought to aid digestion and generally balance the forces in your body. Highly regarded for its health-giving properties, red ginseng is thought to have a warming effect on the body. It is often served in a soup with chicken, which also has warming properties. Ginseng may also be served in a soup with red dates (jujubes), which are thought to improve blood circulation. Considered to be a yin food, winter melon is suitable for cooling the body and regulating blood sugar. Disclaimer: Please note that the information contained above is intended for general interest only. The author is not a doctor; nor claims to be an expert on the subject of using food to improve bodily health.